So, how fun is this, that I get this messaging system with a Spam filter that I’m not able to control, and which anyone is able to bypass it by paying; not me, mind you, but paying Facebook. 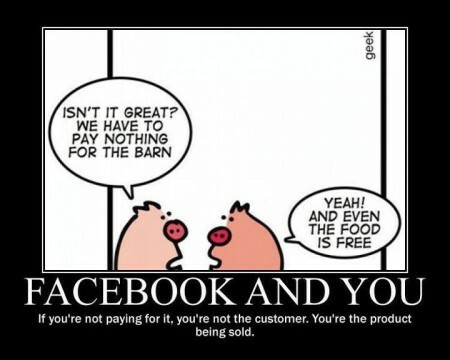 If you’re not paying for it, you’re not the customer. You’re the product being sold. Then, the very next morning, I read another piece of news saying that they are now testing autoplay video ads in the newsfeed (also if the advertiser pays extra, of course). So that was it for me. The decision was made: I had to get out of Facebook. After I decided that I no longer wanted to actively maintain my profile, the first step was to back up my data. They do offer an option to archive the files, which comes with your messages and posts, but no emails from contacts (just the name list) and no comments. It required some workarounds to get all the comments that were important to me (using Evernote clip tool and saving as HTML in my hard drive), but eventually I managed to get all my 7 years of personal communications out of their iron grip. Saving the email contacts from the contact list requires more patience and an Yahoo Account. They refuse to give you the list of emails the easy way, but it can be done. Finally, the most painful step of all is cleaning up the posts. I wanted to clean up everything, as I am keeping the account, albeit abandoned, but I would rather not have all my information there for them to use. It is the most painful thing to run Greasemonkey scripts that kinda work, refreshing when it gets stuck. Think about the sheer amount of junk, likes, posts, photos and what not that I collected over those 7 years… It took me some 5 days to delete everything. Bottom line: I want my communications to belong to me. I want it to be easy to filter out who sends me messages or not. I want to be able to export the messages that are important to me and to delete those that are not. I want to be able to get my contacts list to whichever service I desire. I don’t want to see ads that autoplay when I am trying to check my nephews’ photos.